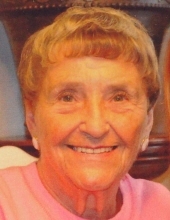 Phyllis J. Horen, 83, De Pere, passed away on January 24, 2019. She was born on June 25, 1935 in Menominee, Michigan to the late Emil and Clara (Kaminski) Palmquist. She attended Menominee High School and married Jerry Horen in Marinette, Wisconsin. For 35 years, Phyllis worked in corporate training for Sentry Foods. She enjoyed traveling and playing cards with her lady friends. She is survived by three sisters, as well as many nieces, nephews and extended family members. She was preceded in death by her mother and father, four brothers and five sisters. Family and friends may visit at Ryan Funeral Home, 305 N. Tenth Street, De Pere, from 10:00 a.m. to noon on Saturday, February 2, 2019. Special thanks go out to the Lady Card Players: Sophie, Mary Anne, Connie and Linda, as well as Rennes Assisted Living. To send flowers or a remembrance gift to the family of Phyllis Horen, please visit our Tribute Store. "Email Address" would like to share the life celebration of Phyllis Horen. Click on the "link" to go to share a favorite memory or leave a condolence message for the family.